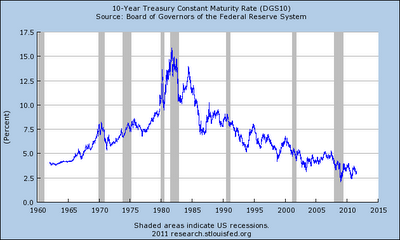 The US has seen bond yields on long term borrowing fall to exceptionally low levels. 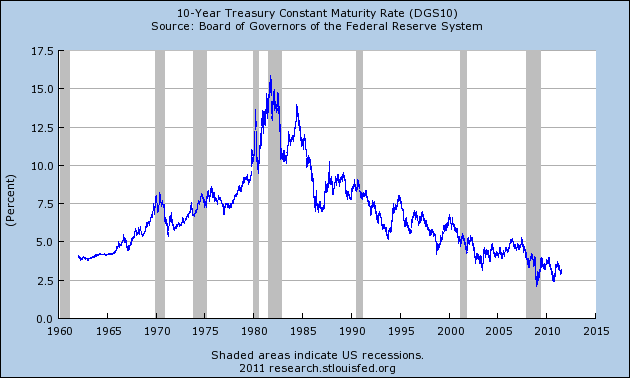 For some bonds there is a negative interest rate, which means you have to pay people to take them. 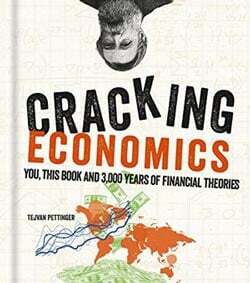 Yet, despite all the evidence of falling bond yields, some in America have tried to imagine they are going to suffer the same fate as Greece, and therefore, the US has to inflict severe spending cuts to reach some imaginary goal of attaining same level of government spending as during period of President Eisenhower. Firstly the US does not face a debt crisis like Greece or other Euro members. The current rise in US debt is partly a response to the recession and current liquidity trap where investors are happy to buy at low rates. The necessity for the US economy is to promote sustainable and high economic growth. This will enable the economy to automatically reduce social security spending and receive higher taxes. In this position, the economy will be better able to sustain structural changes. The US economy does face problems from long term rises in entitlement spending (health care, pensions). This needs careful analysis for the long term. e.g. greater evaluation over automatic health care spending on expensive treatments / raise pension age. However, these long term structural changes won't be helped by panic spending cuts which will aggravate the economic downturn. If the US, through self-inflicted austerity, pushes itself back into an economic recession, then it really could start to face a debt crisis as debt to GDP ratio starts to rise. Why is America so opposed to tax increases? It just feels there is a desire to inflict pain when there is no need. This austerity will prove self-defeating and just reduce living standards.